2. Sterling Silver Figaro Identification Bracelet, 8.5"
4. 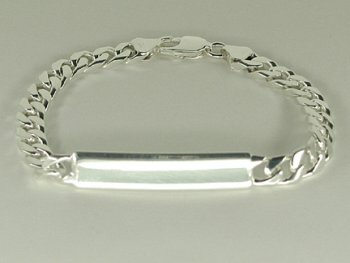 Sterling Silver Men's ID Bracelet, 8.5"
7. Sterling Silver Identification Bracelet w/ 14k Yellow Gold Ends, 8.5"
20. Sterling Silver "H" Link Bracelet w/ Small Identification Plaque, 8.5"